RSPB’s senior policy officer Gareth Cunningham is back with another tale of his seabird journey. In this blog post, Gareth braves the elements to see eider ducks. After an exciting day in St Bees Head, I was looking forward to my visit to Coquet Island. The third day started with a relatively straightforward trip complicated only by the weather. A strong wind was blowing in from the East which although dry, meant a possible trip around the island on a boat was looking unlikely. But the prospect of seeing on of England’s biggest colonies of eiders nestled along the Northumbria coast was not something I planned on missing! A short time later, passing by Hexham and Newcastle, I arrived in Amble and met the RSPB Northumberland Coast Site Manager Steve Morrison, and Marine Conservation Officer Helen Quayle. Taking full advantage of Steve’s generous hospitality, we escaped to his loft and filmed some interviews, hoping the wind would drop enough for the boat to be able to get out of the harbour. After an amazing lunch in the local fish and chip shop, we donned out waterproofs and life jackets and left the harbour to find some eiders. Sadly, the weather had swept the sea up into some pretty choppy water and the harbour mouth was well and truly alive! But while the turbulent waters prevented us from getting closer to Coquet, they did provide some spectacular views of diving terns feeding in the mixing waters. The harbour itself did not disappoint, and before long I was looking at eiders aplenty. Their almost sarcastic call echoed round the harbour as groups of males chased females. Coquet Island is owned by the Duke of Northumberland, and managed by the RSPB for its important seabird colonies. 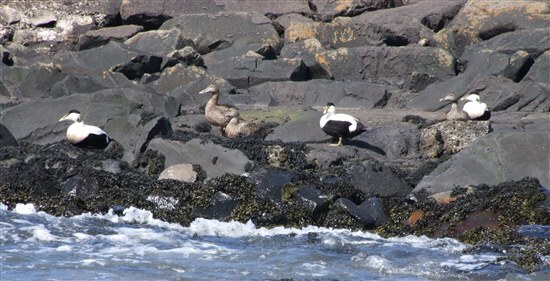 Eider ducks nest on the island and then make their way to the Coquet estuary, where they form crèches supervised by non-breeding females called ‘aunties’. The area is also used by eiders in the winter so a great place for all year round duck viewing. However, the eider are currently lack protection when they leave the island. Thankfully the UK Government’s tranche 3 MCZ consultation (for a bit of background, have a look at my earlier blog) has recognised this gap and is proposing a new site that not only includes the eiders of Coquet, but also those of the Farnes. This is great news and if designated the site will provide year-round protection. You can watch the short video of my visit below. After a cup of tea and a slice of cake (thanks Paul! ), I headed South towards Whitby. Traversing the traffic of the Tyne tunnel, I passed through my old haunts of Middlesbrough and Guisborough before heading up into the North Yorkshire Moors towards my accommodation for the evening, another YHA in Boggle Hole. Of course, I didn’t head straight there! Taking the opportunity of another fine evening, I traversed the moors in search of birds and was rewarded with some spectacular views of the sun setting across the heathland. Keep up to date with the latest news on all things marine (including the tranche 3 MCZs) via twitter and the blog pages. In the meantime our friends at the Wildlife Trusts have launched an online action giving people the chance to have their say and support these new MCZ's. Please help by signing and get these special sites protected.